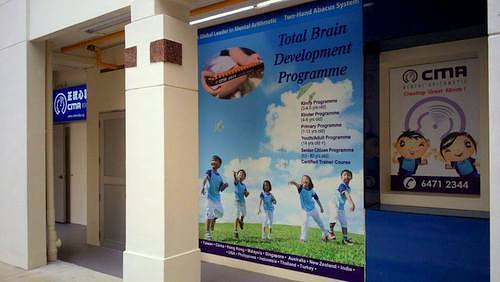 CMA Mental Arithmetic Centre has a total of 23 locations throughout Singapore, including one within Queenstown (Blk 82 Strathmore Avenue). Established in 1984 by Master Tai Chiang Ching from Taiwan, Classical Mental Arithmetic (CMA) International is a MOE-registered educational centre specialising in two-hand abacus mental arithmetics through multimedia-based curriculum. CMA focus is on offering a credible teaching system that emphasises total brain development. To achieve this, their multimedia-based curriculum has been tested and proven for more than three decades, making them one of the leaders in marrying the traditional way of teaching abacus with the contemporary means of IT. Furthermore, CMA is managed and backed by a team of qualified professionals with a wealth of teaching experience and management skills. Over the years, the company has trained numerous students who have performed very well academically and also achieved top honours in major abacus competitions. Overall, CMA’s goal is to help every child unleash his or her mental potential through the two-hand abacus mental arithmetic methodology. As a mental arithmetic training institute, CMA International is one of the world’s fastest growing ones. Today, they have presence in Taiwan, China, Hong Kong, India, Malaysia, New Zealand, Singapore, Australia, Egypt, Sudan, USA, The Philippines, Indonesia, Turkey, as well as Thailand. The official Facebook brand page for CMA Mental Arithmetic Centre Singapore is available at www.facebook.com/CMASingapore. Following the Facebook page, you’ll learn more about CMA’s range of courses, events, and much more.